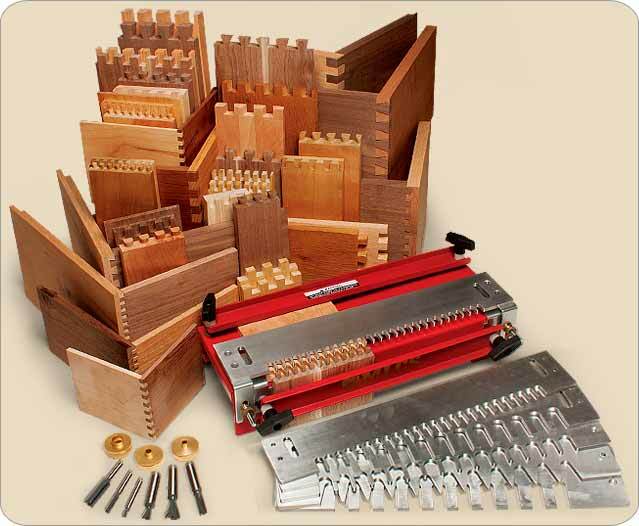 The Master Joinery Set is a complete joinery solution. Make half-blind dovetail, through dovetail and box joints. Includes 6 templates, 3 bushings, and 6 router bits! 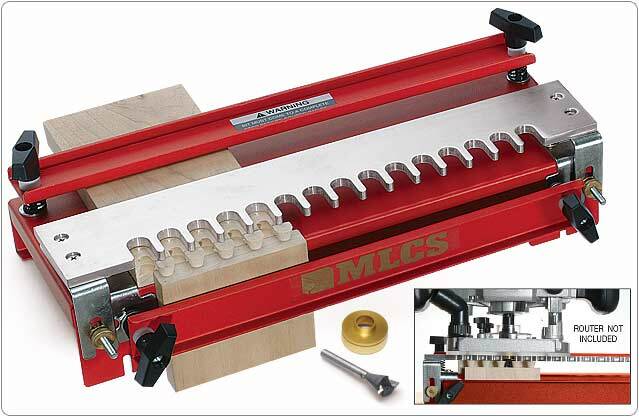 Includes the MLCS steel Dovetail jig, six templates, three bushings and six router bits! SAVE $36! MLCS self spacing edge guides allow precise offset for perfectly aligned joints. Includes our 12" steel jig, six solid aluminum templates, three guide bushings (5/16", 3/8" and 5/8"), six carbide tipped router bits (1/4"-8°, 1/2"-14°, 3/4"-14° dovetail and 1/4", 3/8" and 1/2" straight) and detailed instruction manual. The steel beams of our dovetail jig secure both work pieces snugly. 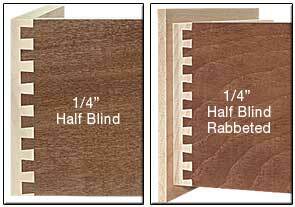 Since both sides of the half-blind dovetail joint are cut at the same time, a perfect fit is assured for each joint. Detailed instructions are included for each template and joint. SAVE $36. List price $246. 1/4" wide box joint with wood stock. 1/2" wide box joint with wood stock. THIS IS ONE EXCELLENT PRODUCT AND VERY GOOD QUALITY. The biggest plus for this system is that it is reasonably priced. With practice and patience it will produce the desired joinery. Based on several years of using the system. However, a few words of caution are in order. First the written directions are really bad. I actually had to download the instructions for the Porter Cable dovetail machine and templates to figure out how to use the MLCS System. Although the products are quite different those instructions supplemented those that came with the system. I notice that videos are now available, which likely area big improvement. Second, the bars don't hold the stock vary well. I improved the machine by adding some steel reinforcing bars at my local hardware store. The fix was easy, and reaulted in stiffening the bars, but I would have preferred to have avoided the need for modification in the first place. Third, the knobs that are used to tighten those flimsy bars have failed several times. If you over-tighten, the metric nuts within the plastic knobs strip. But, it's easy to over-tighten, because it's almost impossible to adequately hold the stock in place. Because the knobs are metric, the only source I was able to find was by calling MLCS, which, thankfully, is able to provide replacements at a reasonable cost. (Incidentally, if the stock slips even slightly, the process will fail miserably. Will not work on 1/2" stock without working on this item. MLCS NOTE: As noted in the Instruction Manual included with this product, additional spacers can be used when thin stock cannot be clamped due to the positioning and size of knobs. Our technical department also provided the customer other options for resolving this issue with his particular application. The jig and the templates are top notch. The reason I have given this only 3 stars is because the manual is terrible. The photograpic references are so out of focus that you can't see what they are trying to show so following setup instructions is difficult to say the least. The text is somewhat vague so without good illustrations it's difficult to set the jig up. NEW VIDEO! Includes 5/8" router guide bushing and self-spacing edge guides. Sets up fast! This easy to use solid aluminum template and steel jig is precisely machined for creating strong, secure and accurate half blind dovetail joints or half-blind rabbeted dovetail joints. This is the perfect solution for sturdy boxes and drawers with the classic dovetail joint design.The solid aluminum template is CNC machined. The steel beams secure both work pieces snugly. Works for 1/2" to 1" thick drawer sides and 5/8" to 1" thick drawer fronts (up to 12" high). 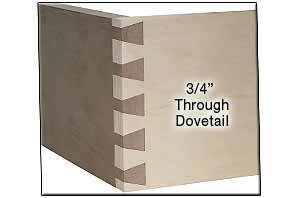 Since you cut both sides of the half-blind dovetail joint at the same time, a perfect fit is assured for this joint. Self-spacing edge guides allow perfect offset for precise joint alignment. The detailed instruction manual guides you from initial setup through final assembly. SAVE $10! List price $79.95. Unless you were born 20 minutes ago or can't remember the adage, "When all else fails, read the instructions," you don't know what a find this jig is! It makes life easy even for someone who's all thumbs like me. It's cliche but it's true that it'd be cheap at twice the price. I looked at a lot of jigs and decided on this one from MLCS. Glad I did. This one is easy to set up and operate. If you cannot set up and run this jig you have no business wood working. Just read and follow the instructions and you will be amazed at what a fine piece of equipment you have purchased. My only regret is I cannot give it 6 stars! Once you set it up and tune it in, it works great.. Received this as a gift a year or so ago. I had a very hard time with it at first because the instructions weren't clear and I had a heck of a time trying to tighten the front clamp knobs because the plastic knobs for the clamp bar kept hitting the ends of the threaded rods for the template when I clamped 1/2 inch stock. Gave up, set it aside for a while until I had a project where I wanted a lot of dovetailed drawers. After attaching a piece of 5/16" scrap stock to the back side of the front clamp bar and a pair of nylon washers under the knobs, I can now tighten the front bar without scraping the template position studs. Very careful re-reading of the manual and a couple hours of fiddling, testing, and adjusting got me to where I could reliably, accurately produce a drawer box with half-blind 1/2 inch dovetails at each corner in about 10 minutes. Once I got it dialed in it stayed that way and proved very quick and easy to use. Any time you change the setup for a different joint type you should expect to have to spend time tweaking and adjusting and making test joints until the fit is right. That's true of ANY dovetail jig. Follow the manual's advice, and once you have it set up just right grab a block of wood and trace the outline of the template on it so you can return to that setting easily later. I knocked off one star for the annoying front clamp problem and for leaving it up to me to figure out how to adjust the spacer to get a clean half pin at the start of the joint. Otherwise, though, now that I've had a chance to get to know the jig and use it for real, I'm quite happy with it. Seriously impressed with the value! Just received it. IT works great! This dovetail jig works well but it took a long time to set up, but once I got it set up it worked well for the price. I used it for making six oak drawers for an entertainment center. I would recommend this jig if you were not going to use it very much because it is fairly time consuming to use. it is a very basic jig with no bells and whistles, the clamping system is less than ideal but seems to work ok. the adjustments are fairly straight forward but not super easy to adjust. I have nothing bad to say about this jig. For the money it could not be easier and more straight forward. Thanks MLCS!! I have clarified instruction issues and I should have been a little more specific in my review. cant beat quality and price. overall product works well. 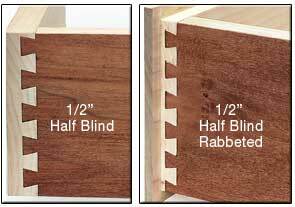 Create decorative and secure half-blind or Rabbeted half-blind dovetail joints on small drawers or boxes. Self-spacing edge guides are included to provide the proper offset for precision joint alignment. Works for 1/4" to 1/2" drawer sides and 5/16" to 1/2" thick drawer fronts (up to 12" in height). 1/4" diameter carbide tipped 8° Dovetail Router Bit included (1/4" shank). 5/16" OD guide bushing required (not included- item #9048). Make a classic through dovetail joint, a joint that is the hallmark of fine craftsmanship, with our 2 pc accessory templates. These templates produce a 3/4" tail that is spaced 1-1/8" on center. 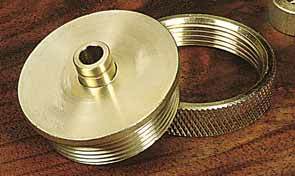 Perfect for making decorative secure joints on drawers and jewelry boxes. Requires a 5/8" router template guide bushing (not included- Item #9049 ). For stock thickness from 1/2" to 7/8" (max). FREE carbide tipped 3/8" straight and 3/4" 14° dovetail bits included. 5/8" OD guide bushing required (not included- Item #9049 ). I couldn't make a good dovetail(by hand) to save my life. I bought the template and on the first try did a great job. I'm very pleased with this. I screwed the template to a block of wood just like John Nixon said to do in the video. The box joint or finger joint is one of the best general purpose joints. Make small wooden boxes, tool boxes and utility drawers with decorative exposed corners. 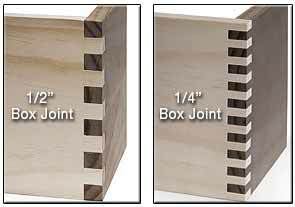 Box joints are quick and easy to make and are very strong. 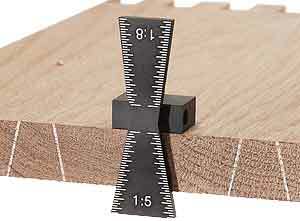 Free 1/4" shank straight bit is included with each box joint template. 1/4" template can be used with stock thickness of 1/4" to 1/2". 1/2" template can be used with stock thickness of 1/4" to 1". Complete instructions included. With 1/4" shank, 1/4" dia. straight router bit. 3/8" OD guide template required (not included- Item #9047). With 1/4" shank, 1/2" dia. straight router bit. 5/8" OD guide template required (not included- Item #9049). Why don,t you supply the 5/8" bushing with the kit? I can,t make any jigs without the 5/8" bushing. MLCS NOTE: The product description does note that the required 5/8" Guide Bushing is not included. This is to save cost for customers who may already have this bushing. You'll need this marker if you're cutting dovetails by hand. MLCS Dovetail Marker is a very handy tool that can mark dovetails up to 1" long and has two ratios: 1:5 for softwood and 1:8 for hardwood. Cutting dovetails by hand can be a daunting task. 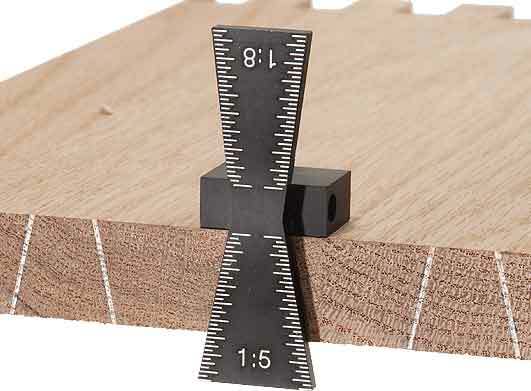 This dovetail marking gauge makes laying out the angles simple and precise.